The emotional touch that comes with engraved birthday gifts can’t be denied-- it’s one of the best ways to show someone just how much they mean to you. They’ll have a unique personalized item to cherish, along with the memory of who it came from. Frederick Engraving is a top-notch online source for a wide array of personalized birthday gifts. We were founded in 2012 in a home office and saw so much interest that our business is now a thriving online store. We supply quality products with laser-cut engraving that’s both artistically skillful and durable. Our impressive stock of customizable wares allows you to find the most fitting gift to carry your personal message or sentiment. Each category of items can be engraved to feature a heartfelt reminder, name, or date to create a one-of-a-kind piece to be enjoyed for years to come. From jewelry to kitchenware to sporting goods, with Frederick Engraving, you’re guaranteed to find a perfect option for engraved birthday gifts. We bring the finest customizable products to you. Frederick Engraving caters to the more typical personalized birthday gifts in our jewelry and accessories. We work with acrylic, metal, and wood to create fine customized pieces that will last and last. Our laser-cut acrylic nameplate and letter charms for necklaces, earrings, and bracelets are a great funky form of fashion expression. For a more classic look, we also have fine gold and silver charms for monogrammed necklaces and earrings. For the suit-wearing friend, a pair of customized cufflinks with their initials in wood, metal, or acrylic can be the perfect present. Gift your loved one with the memory of a special photo and a personal message on our customizable fine wooden picture frames. Is your companion a genius in the kitchen? 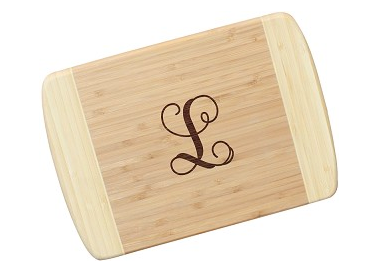 How about an engraved bamboo cutting board to brighten their cooking experience? We have a large selection of customizable glassware and drinkware for those who like to mix and share drinks. For the athletes, we have engraved and monogrammed golf balls, for the holiday enthusiasts we carry stylish glass and wood Christmas ornaments to carry a special reminder, and you can even get a friend’s beloved pet their own celebratory treat in the form of a customized name tag. Frederick Engraving has so many options for engraved birthday gifts, and our great aesthetic eye will ensure your presents will be loved and enjoyed. Shop Engraved Birthday Gifts Now !